As an undergraduate at Valparaiso University, I was drawn to the ways in which the campus embraced academic scholarship and Christian faith together, as complementary elements in a person’s life, rather than as opposing forces. A hymn frequently sung at convocation and commencement refers to the campus as both “Athens and Jerusalem,” a center of both intellectual and spiritual wisdom. The university’s motto “In luce tua videmus lucem”—“In Thy Light, We See Light”—is a wonderful expression of how faith enhances scholarship. But Valpo does more than just talk about faith and scholarship. Many of my professors modeled how rigorous academic inquiry could be rooted in Christian belief with their own scholarship and their interactions with students. Both the overall ideology and mission of the university, as well as the everyday practices of those who worked there, played a large role in my own development as a Christian scholar. These two aspects of Christian scholarship which are found both at Valparaiso University and many other Christian colleges and universities—the theoretical vision and the individual practice—ideally work hand in hand. The larger questions of vision provide students and faculty a framework in which they can situate specific moments in the classroom, lab, and rehearsal space, thus forging an understanding of Christian scholarship that draws from both theory and practice. While the three finalists for the 2015 Lilly Fellows Program Book Award are, on the surface, quite different—engaging with topics ranging from sign theory to the history of Pietism in higher education—when taken together, they, too, provide a similar overall picture of a Christian scholar. As seen in these three texts, Christian scholars are not only equally comfortable with the intellectual debates of Athens and the spiritual devotion of Jerusalem, but they are also able to take what they know and believe and use it to engage the students in their classrooms. 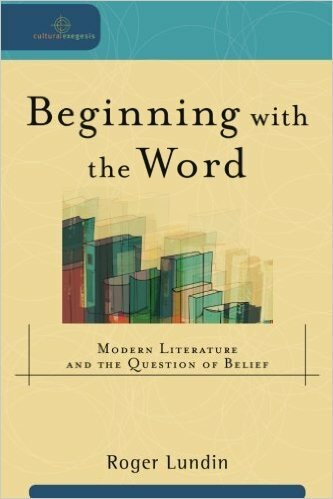 Of the three finalists, the volume with the most theoretical approach is the late Roger Lundin’s Beginning with the Word: Modern Literature and the Question of Belief, which engages with the debate over “whether words somehow belong to reality and embody truths about God and the world or whether they are primarily signs employed by the powerful to order the world according to their purpose” (15). Much of what Lundin does in his study is to examine the tension between structuralism (particularly as a school of linguistic and literary theory) and Christian belief, framing this tension with key points from theorists such as Ferdinand de Saussure and Hans-Georg Gadamer and then providing supporting examples from authors such as Emily Dickinson, Herman Melville, and William Faulkner. While a variety of social forces have led to the secularization of modernity, Lundin notes, to truly account for the “transforming potential of language” (58), we must return to the doctrine of the Incarnation as described in the first verses of the Gospel of John: “In the beginning was the Word, and the Word was with God, and the Word was God. He was in the beginning with God. All things came into being through him, and without him not one thing came into being.” Ultimately, Lundin argues, “we do best [with these complex questions of language] when we follow the arc of the very story of redemption that the Christian proclaims” (220). 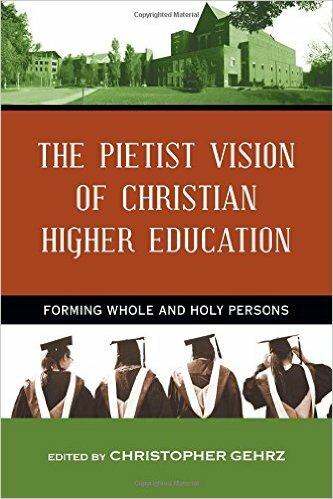 Christopher Gehrz’s collection of essays, The Pietist Vision of Christian Higher Education: Forming Whole and Holy Persons, provides a bridge between theoretical discussions of Christian scholarship, as seen in Lundin’s work, and the more practical issues of Christian scholarship that appear in college classrooms. The overall question that frames this essay collection is whether or not the Pietist vision can provide a usable past for Christian colleges and universities, focusing in particular on Bethel University in St. Paul, Minnesota. But it is more than just the content of the collection that engages the Pietist tradition; as Gehrz describes in the introduction, the goal of the authors was “to present an approach to Christian higher education that is Pietist not just in content but in tone” (30), including a more pronounced use of the academic “I,” frequent meditation on Scripture, and a spirit of humility throughout the work, an approach that provides a refreshing blend of both theory and practice. While many of the essays in the collection address key texts and ideas from the Pietist tradition and how those ideas might be manifested in the classroom, Christian Winn’s essay “Pietism and the Practice of Civil Discourse” stands out as particularly relevant, especially given the contentious nature of the 2016 election season and the increasing diversity seen on many college campuses. Winn makes a distinction between unity and uniformity, noting that this distinction “leaves us with the challenge of how to live together in such a way that we make space for real and legitimate differences, without severing the bond of faith that holds us together” (125). Winn then takes this question and highlights four Pietist virtues that he sees as “helpful as we consider what it means for us to be civil in our differences” (127), concluding his chapter with practical strategies for both faculty and universities in general to model “how to engage, think with and seek to understand those with whom one may disagree”—a goal that Winn sees “should be central to the practice of a Christian university” (131). 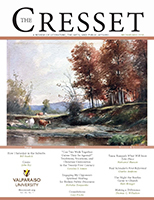 Though Katherine Nevins’s essay “Calling for Pietist Community” has a different overt focus than Winn’s, her examination of how Philip Jacob Spener’s seventeenth-century Pia Desideria can be used in the twenty-first century classroom similarly points to the need for both humility and openness to others’ ideas in “creat[ing] and sustain[ing] a transformative learning community” (59). When discussing the goal of creating a classroom “where all are needed and welcomed to participate, full members of the learning endeavor” (60), Nevins describes using the concept of the Cheyenne medicine wheel as a model for an exercise in which students have to write about an object they are viewing from a single perspective. As Nevins writes, the way the object physically appears varies depending on where the student sits, but even more significantly, “the way the person views the object differs” as well. Not only does this practice draw from traditions outside of Christianity, but it also provides a valuable pedagogical exercise “that validates different ways of seeing and emphasizes the inevitable limitations of one’s personal viewpoint” (61). Essays such as Nevins’s and Winn’s point to an increasing need to consider how Christian scholarship can not only survive, but flourish in a landscape of higher education that is marked not only by financial pressures and increased competition, but also increasing spiritual diversity in faculty and students. While colleges and universities such as Valparaiso and Bethel remain key in considering the question of Christian scholarship, it is perhaps even more important to think about ways in which the idea of Jerusalem can be found and fostered outside of the walls of historically Christian colleges and universities. While broadening the idea of Christian scholarship might initially seem like a defensive reaction to changes in higher education, it can actually be a proactive way of reminding both students and faculty of the larger meaning that their lives possess, thus enabling them, in the words of Mark Schwehn and Dorothy Bass, to lead more deliberate “lives that matter” (Leading Lives That Matter [Eerdmans 2006]). It is this shift toward a broader understanding of Christian scholarship that is seen in Becoming Beholders: Cultivating Sacramental Imagination and Actions in College Classrooms, edited by Karen E. Eifler and Thomas M. Landy, the winner of the 2015 Lilly Fellows Program Book Award. This collection explicitly focuses on the pedagogical practice of Christian scholarship in a wide variety of contexts, rather than addressing a particular theoretical approach. Several of the authors within this collection address this point directly; Joanna Ziegler, for instance, argues, “the pursuit of a meaningful spiritual life is not the result of amassing erudition and theory but of learning how to lead that life in a routine daily way” (42). The practical, day-to-day focus of many of these essays make this the essay collection that Christian higher education needs as it considers its place in the twenty-first century. The fact that this everyday focus is met in many of the essays with humor, ­pop-culture references, and a casual tone further underscores the ways in which Eifler and Landy’s volume will resonate with a wide variety of scholars, not just those of the Christian tradition. While the essay collection has a general focus on Catholic colleges and universities, the diversity of the authors—both in terms of discipline and religious background—gives the collection a much more expansive overall feel, pushing the scope of the collection beyond the Catholic tradition to faith-based scholarship more broadly. Not only are there essays from those outside the Catholic faith—one author discusses teaching a class on Buddhism—but there are also authors from a wide variety of disciplinary backgrounds. One of the most fascinating essays in this regard was Stephanie Salomone’s essay “This I Believe” on the intersection of faith and geometry. In her course on modern geometry, Salomone presents her students with conflicting mathematical axioms—Euclidian geometry and elliptic geometry—the former allowing for parallel lines, while the latter does not. Salomone uses this example to show students how their choice of initial assumptions “absolutely determines the way in which the resulting mathematical world is constructed” (296), enabling students to think about comparable assumptions that they make that structure their own lives and beliefs. Because of this diversity in both faith tradition and academic discipline, Becoming Beholders truly has the potential to spark conversations about faith and scholarship in all sorts of unexpected places—and the larger discussions about faith and higher education will be that much richer as a result. In spite of this diversity, however, Becoming Beholders does not feel fragmented or disjointed due to the skillful way in which Eifler and Landy carry several key themes throughout the volume, in particular the theme of “the sacramental imagination.” As Eifler and Landy explain in the preface, “Sacramentality conceives of God as active in, and through, the material world” (ix). Many of the authors describe the ways in which they envision their classrooms as spaces that foster their students’ sacramental imaginations, that is, the ways in which they see “God manifest throughout the natural, created world” (ix). 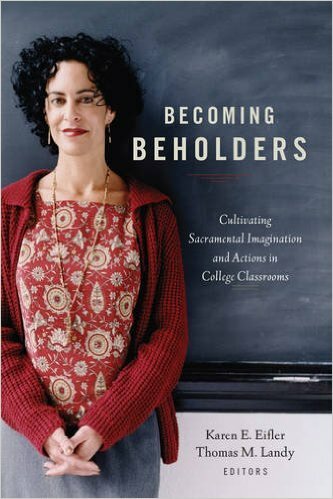 Perhaps even more helpfully, the authors in Becoming Beholders provide “specific, straightforward practice[s]” (xii) that demonstrate ways in which they foster these sacramental imaginations in their students. In Eifler’s interview with Sister Angela Hoffman, for example, Hoffman describes how she requires that her students make their thought processes visible, explaining “why their model makes sense, given all the facts we have acquired from lectures and lab and reading.” The result, she explains, is that students “ask more questions and see more possibilities of ‘correct’ answers in the most unexpected places,” like the student who wondered “how many moles of air there are in a typical human breath” or the student who was curious about “how much sodium azide it would take to fill up [a 1994 Saturn’s] 4-liter airbag” (229). 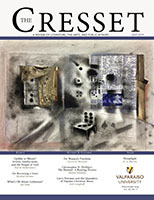 In her essay “Practice Makes Reception,” Joanna Ziegler describes how she required students to write a weekly five-page essay on a single work of art from the local art museum, an assignment I have actually adapted and used to great success in my own developmental writing courses at Normandale Community College. As Ziegler explains, this assignment of repetitive looking and contemplation comes close to practices “identified with the great spiritual and mystical traditions of Christianity and Eastern religions such as Zen Buddhism” (41). These specific examples enable faculty members to make the transition from a more general understanding of the sacramental imagination to particular assignments and lessons that they can implement in their own classrooms. The vision of sacramental imagination found in Becoming Beholders, therefore, is not just an abstract idea, but something rooted in day-to-day acts. It is something that can be practiced by all educators, whether they teach at a Christian university or a local community college. 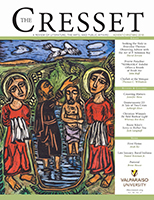 As a result, this vision of sacramental imagination is a model for Christian education in the face of the shifting landscape of higher education—and by providing concrete examples of what sacramental imagination looks like, Becoming Beholders enables individual faculty members to create a vision of Jerusalem in their own classrooms, regardless of where they actually may be. Jennifer L. Miller teaches English at Norman­dale Community College in Minneapolis, Minnesota.